Founded in 1862, you will find everything you need at Stockmann – latest fashion, trendy cosmetics, world-famous Finnish design, souvenirs and much more. Stockmann’s flagship store in the heart of Helsinki offers more than 50.000 square meters of shopping space across ten floors. There are 6 Stockmann department stores in Finland’s major cities, famous for their excellent customer service and wide selection of products. 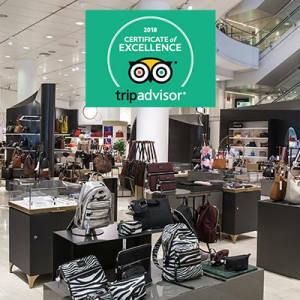 Stockmann’s Visitor Service gives you advice on tax free matters, writes tax free cheques for you and provides you with the tourist discount voucher. The staff are very helpful and fluent in several languages. Come and get your tourist discount voucher from the Stockmann department store nearest you. The voucher entitles you to a 10 % discount off all regular priced purchases on any one day of your choice. Need local information about Helsinki? The City of Helsinki has a tourist information point in Stockmann’s Helsinki city centre department store. Welcome to visit Stockmann and our beautiful capital city!